If you're a California voter having a tough time deciding how to mark your ballot in the lieutenant governor's race, you're not alone. There's a couple of factors making this contest confusing, according to Jaime Regalado, California State University, Los Angeles political science professor emeritus. "If you have two candidates that most people don't recognize, and they're of the same party, it makes for a difficult choice," said Regalado. Both candidates running for the job are Democrats. Neither has great name recognition. State Sen. Ed Hernandez, an optometrist, has spent the last 12 years as a state legislator. Unless you live in his district or you're really interested in state health policy, you'd be forgiven for not knowing who he is. Businesswoman Eleni Kounalakis, who comes from a family of wealthy developers, is a former U.S. ambassador who has never held elected office. She is running TV ads that joke about how no one is quite sure how to say her name. The lieutenant governor doesn't hold much power. But the position can be an important stepping stone to higher office. Just ask former California Gov. Gray Davis or the current lieutenant governor, Gavin Newsom, who hopes to follow the same path Davis took to the governor's mansion. On many issues, it can be hard to tell the candidates apart. Part of the lieutenant governor's job is to serve on the boards for the University of California and California State University systems. Both Hernandez and Kounalakis have said they would not vote to increase tuition. The lieutenant governor also sits on the State Lands Commission. Both candidates have opposed the Trump administration's plans to open up more of California's coast to offshore oil drilling. On these and other issues, their platforms overlap more than they diverge. Hernandez is highlighting his legislative record, especially around health issues. He was behind legislation that raised California's minimum age to buy tobacco from 18 to 21. He also authored a bill to increase drug pricing transparency. Kounalakis is running on her experience as the head of the U.S. embassy in Hungary from 2010 to 2013. She argues her background in development will help in tackling California's housing affordability crisis. She has said that she'll be more focused on higher education than healthcare. Endorsements for Hernandez include those from California Attorney General Xavier Becerra, Planned Parenthood and the California Nurses Association. Kounalakis is endorsed by Barack Obama, the California League of Conservation Voters and Emily's List. Still scratching your head over this race? Here's one big difference between the two candidates: money. 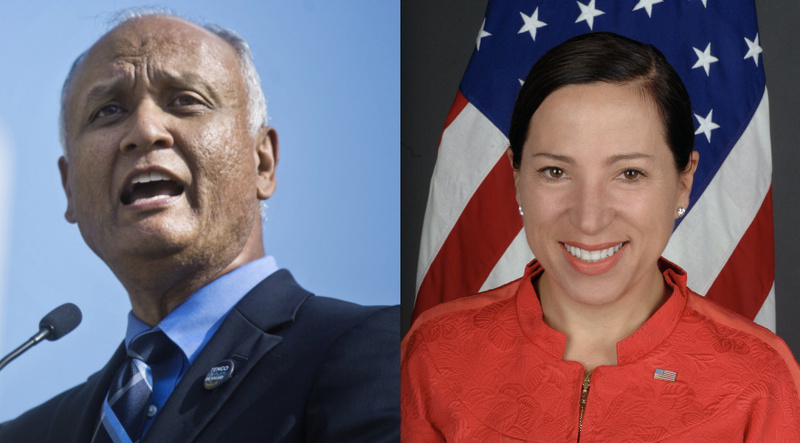 The Kounalakis campaign has raised more than $11 million. Nearly $7.7 million of that is her own money. An independent committee backing her raised another $5 million from her father, Sacramento real estate developer Angelo Tsakopoulos. The Hernandez campaign has raised much less: about $2.6 million. His top donors include labor groups like the California State Council of Laborers. Health insurance companies have also given to an independent committee backing Hernandez. Blue Shield chipped in $250,000 and Anthem Inc. gave another $50,000. Add it all up, and much more money is flowing into this lieutenant governor's race than back in 2010, when Gavin Newsom won his first term against Republican Abel Maldonado. The Hernandez campaign says Kounalakis is trying to buy the election. But her campaign says she's not beholden to donors, and that it's simply not cheap to run a successful statewide campaign, between the cost of TV ads and other expenses. Regalado, the CSULA professor emeritus, said in some ways, it's not that strange to see such lopsided fundraising in this race. "It's an important position without much power," he said. "For those who are looking for a political future — and in the case of Eleni, a kind of baptism into elected office at a very high level — this is your race."